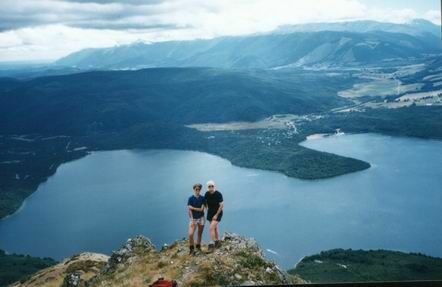 Our objective was to climb up to Lake Angelus mainly as all three of us had never managed the tramp before. We had walked the icy path to Julius and then down to Speargrass but Lake Angelus had remained the one tramp in the Nelson Lakes National Park that had eluded us. ‘Us' being three ladies of an undisclosed age who had tramped together for many a year. 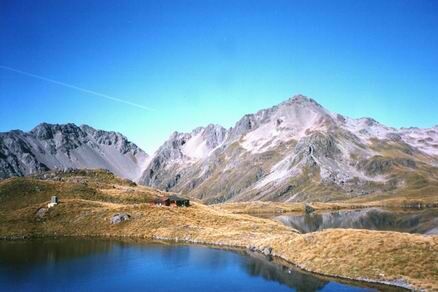 We stayed the night in the village of St Arnaud before being driven to Mount Robert Carpark ready to start our tramp at 9.00am. The day was calm and slightly overcast and as we zigzagged our way up 'Pinchgut track' we admired the wonderful views of Lake Rotoiti and the St Arnaud Range spread out before us. We continued along the ridge. The weather by this time was definitely getting cooler and we were glad we had the foresight to pack hats & gloves. We were aware of sudden weather changes that could catch you by surprise even in midsummer. (Encouraging readers to pack for the unexpected.) On one particular ridge a silent monster of a bird flew over us making us jump. Just a glider making the most of the airlift up the mountain sides! A cold stop for lunch, sheltering under a rock and then onwards past Julius Summit, path full of loose rubble, but well marked with cairns. The cloud and mist was filling up our view to the west by now but to the south we could still see the mountain ranges and beautiful little tarns tucked into glaciated valleys. We followed the ridge up and down with the wind blowing quite strongly. We seemed to be the only ones up on the tops and we had to make it to Angelus Hut before darkness fell. Shale slips meant we had to take our time. A chocolate stop gave us renewed energy. Surely we will soon see the hut! Up and over yet another peak, down the other side and still the track continued! At 6.00pm we finally looked to our right and far down in the basin below lay Lake Angelus and Angelus Hut. The final climb down over the scree took longer than expected and we reached the hut at 6.30 pm tired but happy. 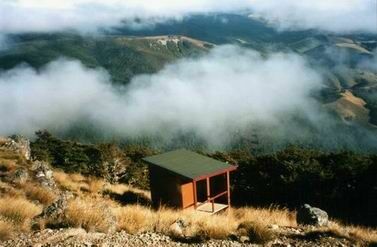 Lake Angelus hut is a new hut that can sleep 36. It was full to overflowing with several trampers deciding to sleep in tents rather than the hut.We still managed to find a bunk though and the sound of the wind whistling round the hut lulled us to sleep. Unfortunately we found when we arrived that the hut didn't have a gas stove for cooking. We hadn't made provision for this and were caught out. The only cooking facilities in the hut were a log burner and old pot. So remember to take your gas stove with you! The weather hadn't improved by morning. Misty rain was falling and cloud covered the tops. We decided to take the quickest way down from the top, via the Cascade Track. Leaving the hut at 8.30am we started down a wet track full of rubble which was part of an enormous scree slip. We could see this spread out before us, so took our time going down the zigzag path. Over to our right we watched a wonderful waterfall leap from the tops and fall 50 metres or more before huge rocks broke its fall. We realised later that this waterfall was the start of the river that we followed for most of the day. At the end of the scree we met the bush and the track continued through a 'meadow' clearing and then followed the every growing river. At one stage the river seems to go underground, reappearing later. Huge boulders showed that an enormous slip had at one stage crashed down the mountainside, coming to a halt just the other side of the river. The bush had grown but the boulders remained At 4.00pm we reached the Travers Track and headed to Coldwater Hut. We hoped to contact Bill Butters and get a water taxi out but unfortunately this didn't eventuate. 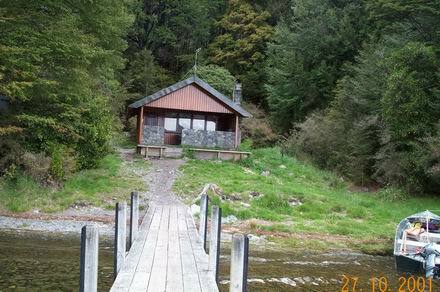 We decided that the eastern Lakehead Track of Lake Rotoiti was the best way to walk out but first we had to cross the Travers River, the delta of the river has many channels! Eventually cold, wet, tired we started out on the track for Kerr Bay. It was getting dark and we realised we still had three hours walking before us. Imagine our surprise and delight when up the track towards us came a guy (Allan Poll) with a lifejacket on . Two guys in a boat had seen us trying to cross the estuary and had decided to tie up at the jetty, and one come to meet us to see if we would like a ride out to Kerr Bay. All three of us felt like hugging him and we accepted his kind offer. Fifteen minutes in the boat and we were back to Kerr Bay. Tired but exhilarated as we had achieved our objective and walked to Angelus Hut! 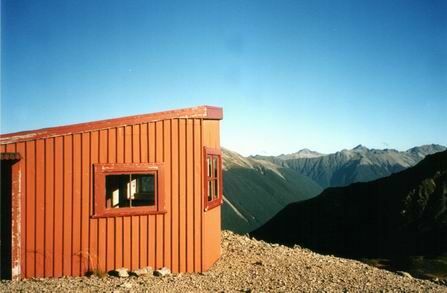 Ann Crozier had a great passion for tramping and enjoying the great out doors. Her zest for life has inspired many people to take up the challenge and tackle the mountains. 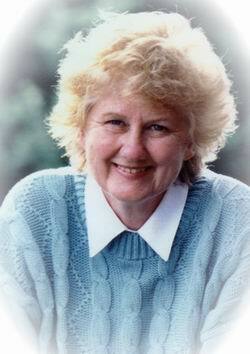 Sadly Ann passed away in 2003. She is missed dearly by the people of St Arnaud and the tramping community.